Not much to say about this. 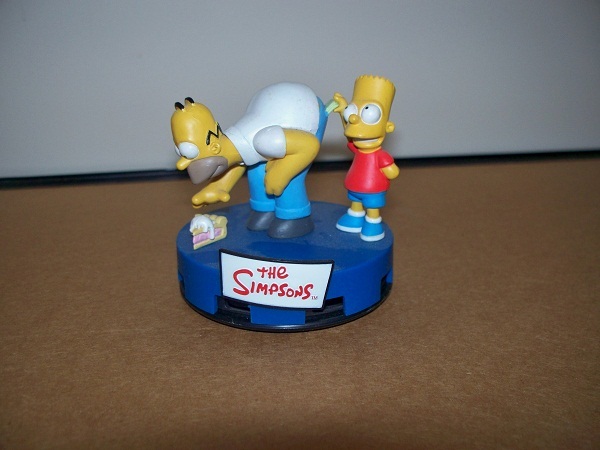 It’s a car air freshener, featuring Homer and Bart in a pose you’ll often see on promo images. The bottom of the figure states that it’s from 2004, but makes no mention of any specific company, so I have no idea if it’s part of a set. It doesn’t smell like anything in particular, but it was probably marketed as that unspecified “New Car Smell”. 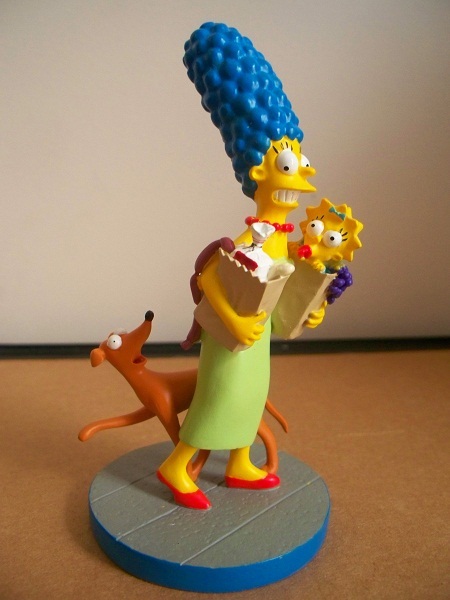 From the “Nuclear Family” collection of the Simpsons line of Hamilton sculptures, “Happy Homer-Maker” features Marge juggling the groceries and Maggie, while Santa’s Little Helper “helps”. The Hamilton sculptures are among my favourite items in my collection. Unfortunately, due to the amount of pieces in the line, and the price of each, I haven’t bought many. Those I do have I either scooped up cheap, or bought because I particularly like them. 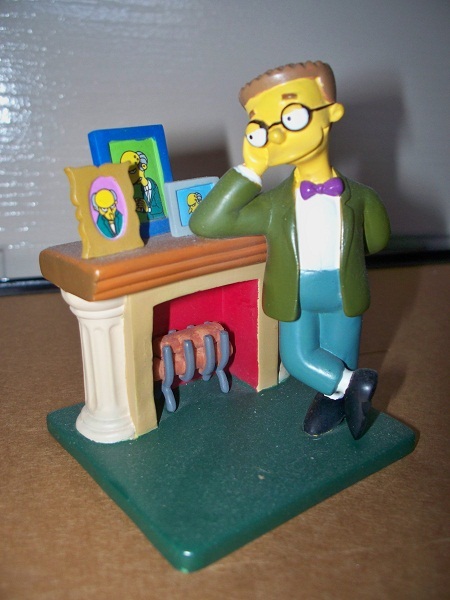 From the “Springfield Citizens” collection of the Simpsons line of Hamilton sculptures, “You’re A Genius, Sir” features Power Plant lackey Smithers admiring his boss and best friend, Mr Burns. I can’t find much information about this one. “1990” is printed on the back, but I’m not sure if it’s part of a set, which company made it, etc. I can’t even find much about it online. It’d be appreciated if anyone can help me out with identifying it. 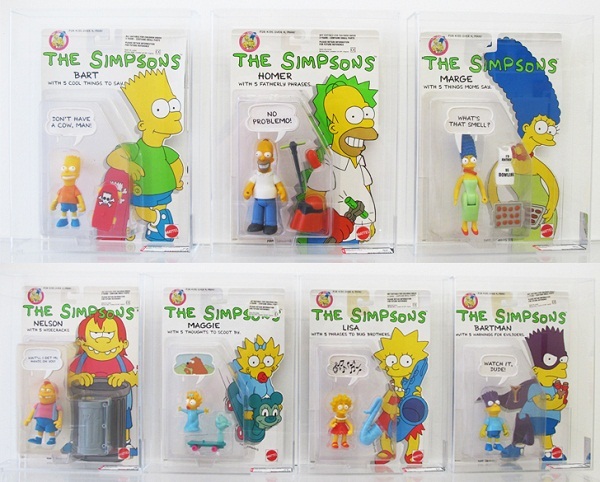 This line of figurines by Mattel was one of the first sets of Simpsons toys to be released. They can be hard to find now, and when you do, they can sell for crazy amounts. I’ve seen the full set, unopened, selling for $2000 on eBay. Or, you might luck out and find them going cheap. 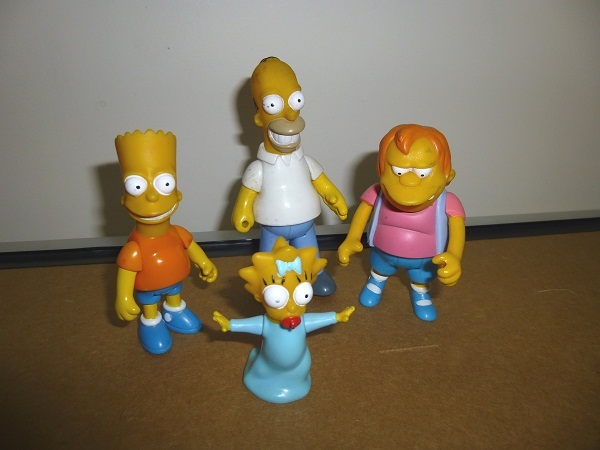 I managed to find Bart and Maggie at second-hand markets for a couple bucks, and picked up Homer, Nelson and another Bart on eBay for about the same. They obviously didn’t know what they had! That’s just the basic figures though: I don’t have any of the accessories pictured above. 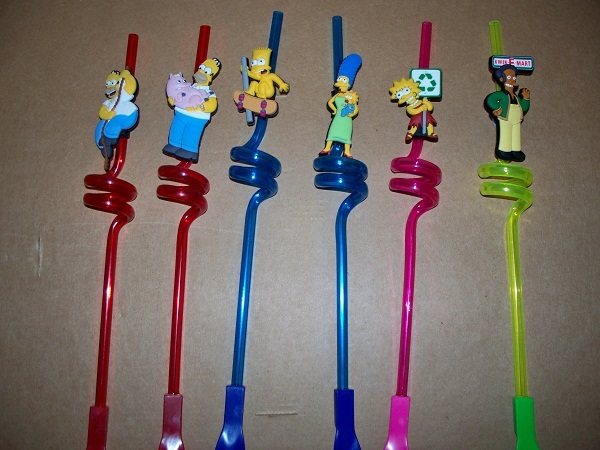 These magnet straws came with the Slurpee/Squishee cups, in 7/11 stores (done up to look like the Kwik-E-Mart) to promote The Simpsons Movie. 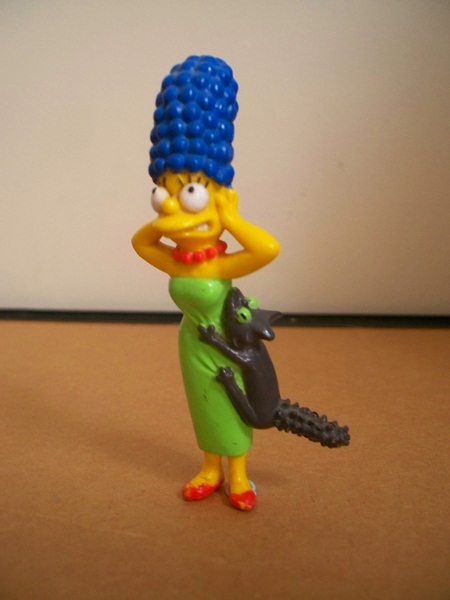 The characters are held on with magnets, and can be removed from the straws. Despite the piece having nothing to do with Christmas, Hallmark released TV Time as a Christmas ornament in the US and Canada in 2008. I’m not sure if it was a one-off thing, or if there were more, but I haven’t been able to find any others. 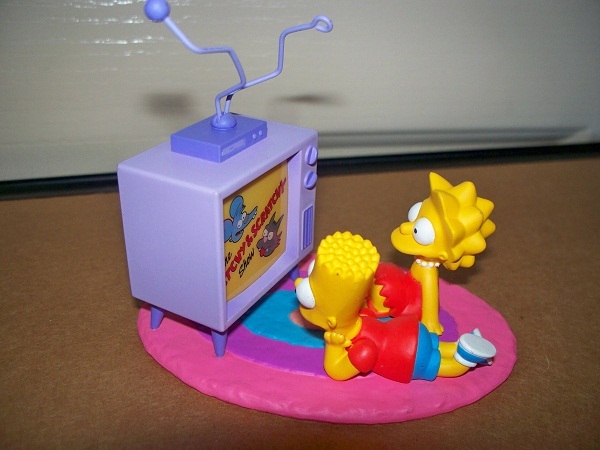 When a button on the side is pressed, the TV lights up and the Itchy & Scratchy theme plays. Well, it’s supposed to. Mine doesn’t work, for some reason.